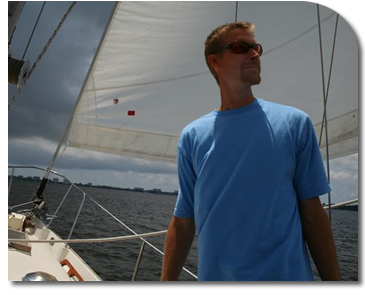 Orange Beach Sailing Charters was founded by Captain Ryan Rayfield in 2007. Ryan is a gulf coast native who grew up on the Alabama coastal waters around Gulf Shores and Orange Beach, Alabama. His love for the outdoors and being on the water is apparent in everything he does. Ryan really cares about quality of life and preserving the lost art of sailing. You will see him sailing by on his yacht, Sailob most any day you are on the beaches of Alabama. With the wind in his sails and the Sun in his face, you will see him cruising along with satisfied customers of all ages along the Gulf Shores. When Ryan decided to leave corporate America in 2006, he took with him a vision of becoming the best in the sailing charter business on the Orange Beach and Gulf Shores, Alabama Gulf Coast. He purchased his sailing yacht three years earlier and took her through a complete upgrade and restoration project. The nine month endeavor was completed in March 2007 and the Sailob Sailing Charter yacht was launched. Ryan uses sailing and sailing charters as a way to share his love for what is becoming a lost art. For centuries, mariners have circumnavigated the globe using the wind as their propulsion. The feeling you get when sailing in Orange Beach or Gulf Shores Alabama will take you back in time. You will understand what it was like to move along on a body of water, only using the wind to get you there. Orange Beach Sunset Sailing was recently awarded the 2009, 2010, 2011, 2012, 2013 Best Sailing Charter on the Alabama Gulf Coast. Sailing Charters in Orange Beach is being redefined by Captain Ryan at Sailob. The 6 passenger sailing yacht is one of the finest sailing charter boats on the entire Alabama Gulf Coast. She is the only sailing charter boat that operates out in the Gulf of Mexico. Everyone else who sails, is confined to the bays and has to stay north of the Bridge at Alabama Point. Sail Ob takes the sailing experience to a new level. Two or three times daily, you can see the best Orange Beach Sailing Yacht heading to and from sea with her sails full of wind. Seeing the sight will certainly make you want to join Orange Beach Sailing Adventures and get underway with Captain Ryan. We at Orange Beach Sailing Charters, prides ourselves by offering the best sailing charter trips of all kinds, to the locals and vacationers to the Alabama Gulf Coast. Everything we do as a privately owned, small business, represents what America is all about. We have strong family values and core business principles that guide us every day. Orange Beach Sailing Charters by design, is all about providing convenience, value and an effort to give you the best sailing charter in Orange Beach, Alabama. Sail Orange Beach is owned and operated by Captain Ryan Rayfield. Ryan and his wife and two small children reside in and participate in the Orange Beach local community. Everywhere you go, you hear someone talking about that sail boat that is always out in the Gulf of Mexico off of Gulf Shores. You hear couples and kids often talking about how much fun they had and how educational their sailing charter was with Captain Ryan.